Joe Quinones' interweb-log: Wonder Woman Re-Design! 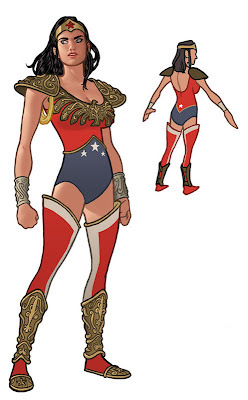 So the fellas over at Project: Rooftop held a contest recently calling for re-designs of DC comics' Wonder Woman. As it so happens, my first P:R entry was also a Wonder Woman re-design (it got rejected (and rightly so)). Anyway, above is what I came up with for this go round. I'll let you know when they post the winners on their site. There's sure to be a lot of cool entries. UPDATE: My design ended up winning the Grand Prize! Huzzah! Thanks to Dean Trippe, Zeus Comics, and all the editors over at Project: Rooftop. And also, as I suspected, there's a lot of cool entries. Grats on a GREAT design! This is, of course, fantastic work as always and a really great design, but I say (despite what you and Dean think) that your previous Wonder Woman was the best redesign of the character ever. Or at least that I've ever seen. Anyway, congrats on the win! Very well deserved. Joel: I totally remember you from SPX, and now that I am in possession of the link to your blog, I shall visit it often. Bwa hah hah.